Portsmouth caretaker manager Andy Awford will meet with the club's board on Thursday to discuss whether he will be offered the job permanently. Awford took over from Richie Barker on 27 March, winning all five of his games to steer them to League Two safety. 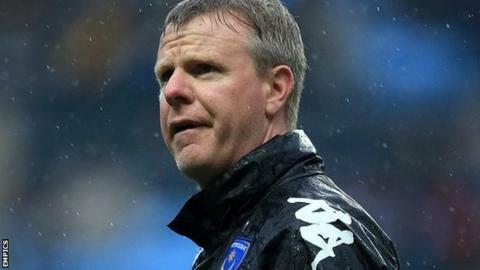 "I've got plans in my own head in case I am manager of Portsmouth Football Club," the 41-year-old former Pompey defender told BBC Radio Solent. "Until I'm asked and we sort it out they will remain in my head." Awford and the board will meet on Thursday when he will learn if the club want him to remain in place for the start of next season. However, if offered the job, Awford says he will need certain assurances from chairman Iain McInnes and the other directors at the club. "If they would like me to do it, I said before that it took me two seconds to decide whether to be caretaker manager as I felt that was the right thing to do," he said. "It will need to take a lot longer than that. There will need to be frank discussions with the board about where the football club is going, the direction they are taking and if we agree then fine and if we don't then we'll keep talking." Awford, who is the club's academy manager, would be a popular choice with the supporters at Fratton Park but he is eager to have control in restructuring the club for the long term. "There needs to be lots of discussion, the board need to think carefully, things have to be right," he said. "If I was lucky enough to be the next manager of Portsmouth Football Club who is going to be the next academy manager? That worries me, we have to get that right. "We have to make sure the football club is built from bottom to top and it isn't at the moment. We have to lay some foundations so the day I move on from this club we've got to make sure the club is sound. It's been mistreated for far too long. "Longevity of the football club is everything. Now we are safe, now is time to put some building blocks in place so that what happened, never happens again."